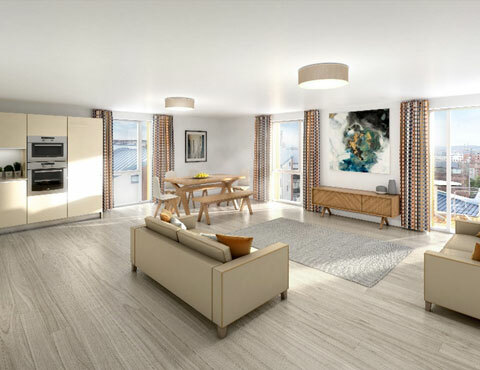 Redcliffe Place is a development of 14 vibrant and modern apartments from Change Living. Redcliffe Place at Redcliffe Parade shares a quiet corner of Bristol that simply oozes character. Tucked away in a tranquil neighbourhood that many describe as one of the city’s best kept secrets, it’s just a stone’s throw from the city’s iconic Floating Harbour and Michelin star restaurant Casamia. The stylishly designed 2&3 bedroom apartments offer the best in city living. The clean and contemporary open plan living space benefits from full height windows that allow light to flow through the apartments, in addition balconies provide stunning views across the city. Entering Redcliffe Place from Redcliffe Parade West, you immediately get a sense of the Georgian heritage of the neighbourhood but with a strong contemporary influence. Porcelanosa tiles in subtle shades are enhanced with volcanic grey doors with chrome handles. Modern chandeliers in the hallways complete the entrance way to the lifts and staircases. Redcliffe Place benefits from secure electronic gate access, with dedicated parking and cycle store. The Redcliffe Place Show Home is launched on Saturday 22nd April 2017. Visit the Redcliff Place website here. To make an appointment to view, contact Jessica Rowe at Knight Frank on 0117 317 1999.